Welcome to Authors and Educators, a company designed to bridge the children’s publishing and education worlds. Its mission is to create quality educational products for the next generation. Publishers who need to develop books or materials for their products can find their solution with Authors and Educators. Authors who wish to promote their books in the school market or prepare for a school visit can develop resources. Publishers and authors who make their books fit the needs of today’s classrooms have a better chance of getting their books in the hands of teachers and students. When children are presented with books in engaging ways, they grow into readers who appreciate literature and language. That’s why all of Authors and Educators’ resources are thoughtful, creative, and standards-based. Additionally, they are created by a professional with years of experience in both writing and teaching. Products include discussion questions, comprehensive teacher guides, and more. 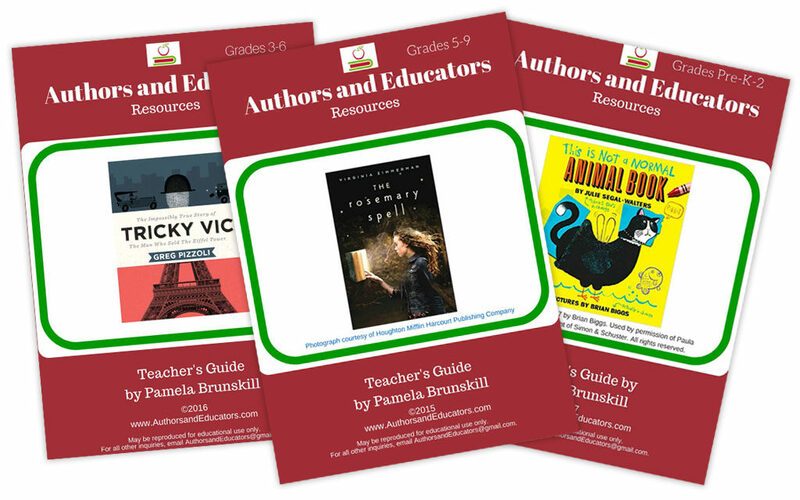 Check out the samples and services for details on how Authors and Educators can meet your needs. This website also includes resources to help you create your own materials. To learn more, contact authorsandeducators at gmail dot com. I am blown away by the the breadth and depth of Pam’s educator’s guides for “This is Not a Normal Animal Book.” Crafting two guides (PreK-2 and 3-5) for teachers and librarians for my book required Pam to develop resources, activities, and recommendations in the areas of science, language arts, and social-emotional education — all of which connect the book to multiple aspects of the PreK – 5th grade curricula and standards. Pam’s expertise of academic standards and teachers’ needs across many disciplines, and her willingness to dig deep into the many layers of the book’s value in the classroom, is unique and extraordinary. Further, while a task of this nature has the potential to be stressful and exacting, Pam’s attitude was constantly positive and “can do,” and her kindness, generosity, and professionalism made her a pleasure to work with at every encounter. I can’t recommend her work more highly. I found Pamela Brunskill’s teacher’s guide for my book “Tricky Vic: The Impossibly True Story of the Man Who Sold The Eiffel Tower” to be incredibly thoughtful and well done. Specifically, I thought the writing activities for students to try their hand at writing some of the scenes from another character’s perspective, as well as the comprehension quizzes for some of the…ahem…trickier sections of the book were very smart. Pam was a joy to work with and I am flattered at how much she was able to get out of my picture book. Pamela created an educational and visually appealing discussion guide for my middle-grade novel Just One Thing! Her attention to detail and knowledge of what goes into a great guide is evident in the questions she created. Teachers have thoroughly enjoyed having this resource at their disposal. In working with Pamela, I found her to be professional and courteous; she always answered my emails in a timely manner, and I appreciated that we could get the project done quickly. I’ll be asking her to do the guide for my next novel, Beauty and Bernice, very soon! Pam Brunskill’s teachers’ guide for The Rosemary Spell includes such a wealth of information to help teachers use the book in the classroom. The connections to the Common Core, the specific lesson plans, and the discussion questions are all wonderfully helpful. I could not be more happy with Pam’s work and have already enthusiastically recommended her to several other authors.